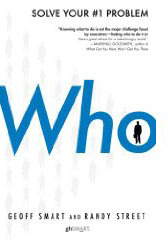 The Wall Street Journal (October 29) favorably reviews Who by Geoff Smart and Randy Street. I'm hooked. In short, if "health care" is a dangerous oxymoron, it is matched, if in a less deadly fashion, by "rigorous interview" in the all-important world of hiring. Mssrs. Smart and Street are said to rip, tear, shred, spindle, mutilate, thrash, and trash the typical prospective employee evaluation process for its shallowness. And the reviewer also reports that the authors provide a ton of solid research and professional experience to support their sorry conclusions. I am disposed to the authors' assessment based on my own, if less extensive, observation—and flawed personal practices. LOOK ... THIS IS A BIG BIG BIG DAMN DEAL. You and I have probably read a dozen, or three dozen, books on "business strategy." (Right?) And perhaps have been to a course or exec course or two or three on the topic. Have you ever read a full-fledged book on assessing folks for employment? Have you read a dozen articles on the topic? The reviewer concludes, "In short, hiring is the most important aspect of business and yet remains woefully misunderstood [my italics]." Ye gads, I think he might well be right.